Posted in About, Preparation | Comments Off on Polar firn aquifers: Why are we doing this? 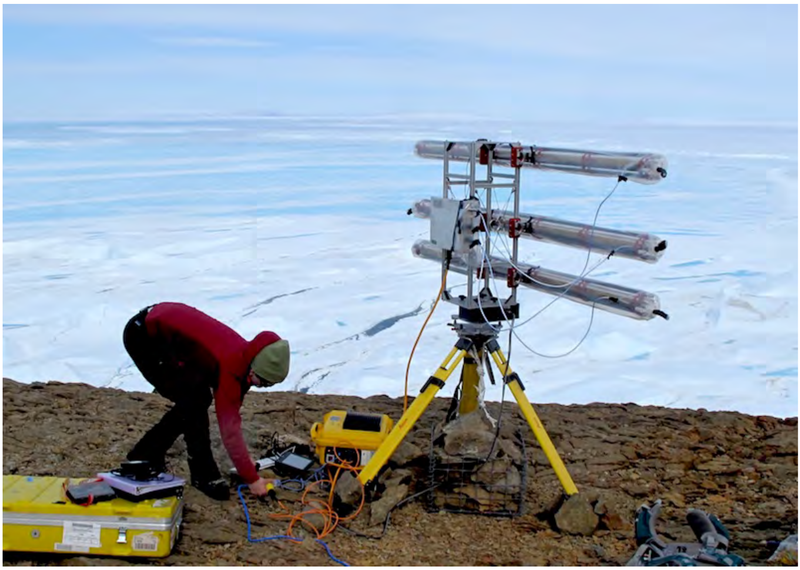 In the first two weeks out here, we’ve set up an array of measurement instruments to observe how the ocean ice (‘fast’ ice near the coast) and the much thicker ice shelf ice behave at the end of the summer. In past years, this has been the time of year when major changes, and even ice shelf collapse, have occurred. The weather has turned cooler, and it is unlikely the ice will break out this year, but the instrumentation we have brought, and the long steady data acquisition we’ve had since we set up the instruments, has yielded some interesting results. 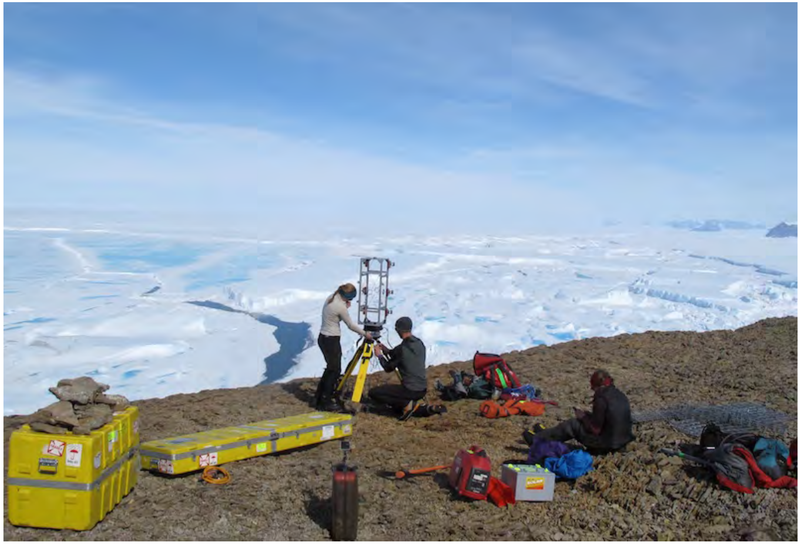 One of the main instruments we set out are time-lapse cameras. The idea here is of course to detect changes in the ice fracture patterns, and any movement of the icebergs that are the breaking away from the ice shelf. We have set out six camera systems, as two stereo pairs (for 3-D data) and as ‘eagle eye’ systems looking at the most active features. The pre-installed AMIGOS-6 system has been watching the area 4 times a day for the past 4 years, but we’ve set up much faster systems now to catch a movie-like view of the changes, with 2-minute repeats of each scene. Sure enough, during some wind-storms we’ve seen the fast ice fractures move a bit, straining as many square miles of rough ocean ice surface are pushed by the wind. Satellite pictures tell us that the biggest wind-storm (gusts to ~40 kts, or around 20 m/sec) pushed the loose sea ice to the east of us about 3 kilometers… but the fast ice here held. 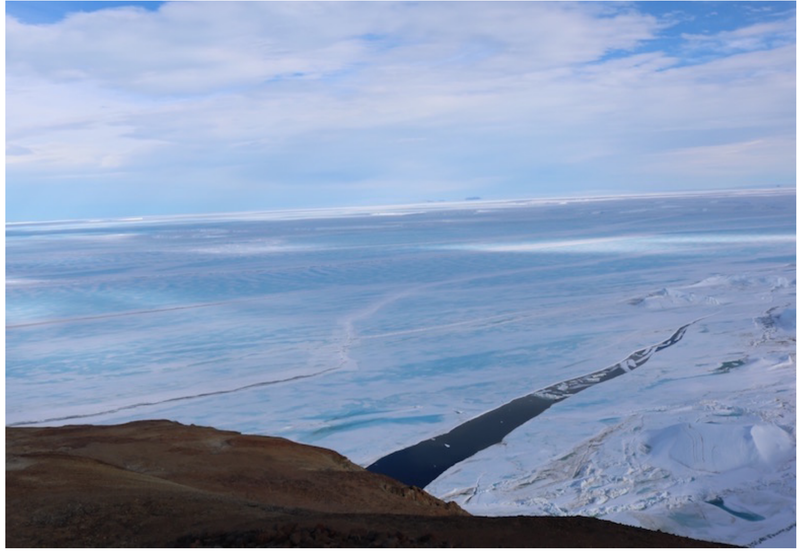 Time-lapse cameras watch the fast ice, icebergs, and ice shelf junction area from the outcrop we call ‘Pippa’s Point’. The cameras have been taking pictures every two minutes for ~15 days. We have a more sensitive way of looking at ice motion: a radar system. This radar array (the Gamma Portable Radar Interferometer, or GPRI) collects data sets that can be very sensitively differenced from one another, to detect even millimeters of movement. This is the instrument we anticipate will tell us the most about the state of the ice in this area, and may provide clues as to how much the fast ice is buttressing the ice shelf and inhibiting its break-up (or ‘calving’ in glaciology terms). 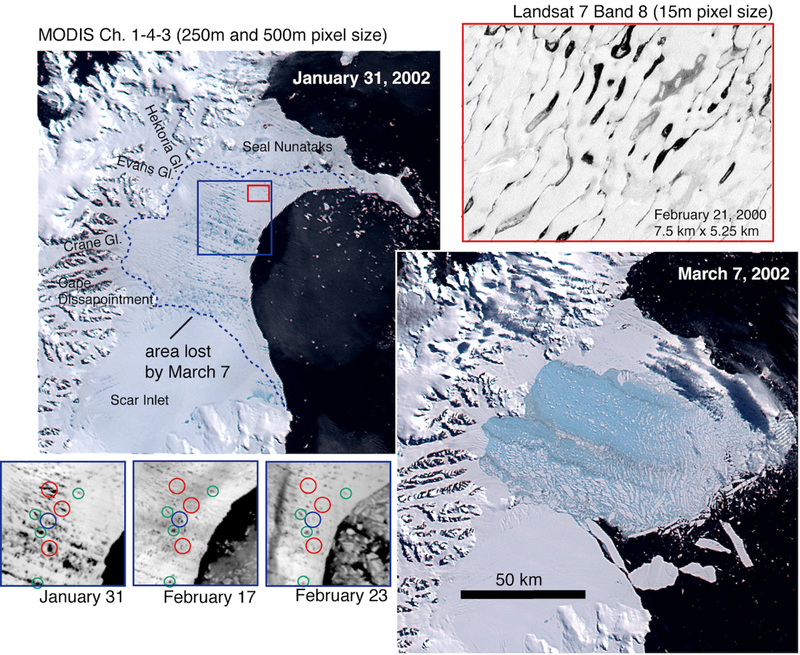 We may see a tidal signal of ice movement and fracture, and it appears that we’ve captured smaller versions of the ice shelf collapse process in some of the icebergs close to the system. The team has worked extremely hard to keep this high-tech instrument going in the conditions of a deep field tent camp, but it has paid off in several terabytes of data. Early processing here in the field shows that we’ve captured the movement of the ice well, and have data extending out to about 8 km. Chris Carr and ‘Chucky’ Stevens assemble the radar interferometer at ‘AMIGOS Point’. Chris adjusts the data cable for the radar array. A much simpler ‘radar’ system, really more of a radio-echo sounder, was used to map the ice thickness over the cape. 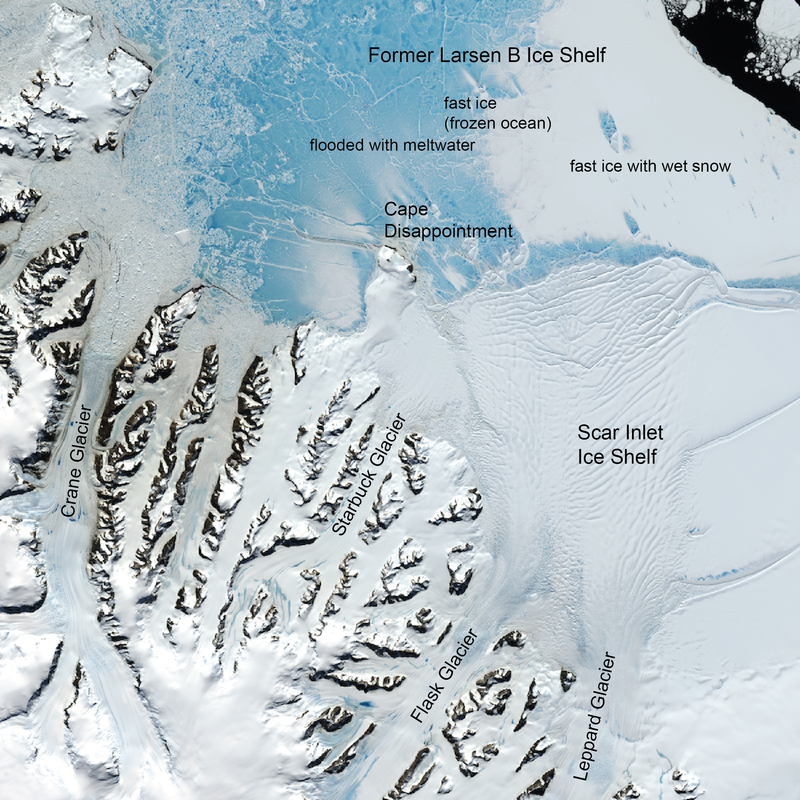 It looks like our cape is actually an island: the neck of ice that extends out from the main coastline appears to rest on rock that is below sea level. If the area were to melt away completely, this would change the local currents. The radio-echo-sounder measured a profile of the the ice thickness at Cape Disappointment. Other sensors aim to use sound and vibration as an indicator of processes going on in the area. 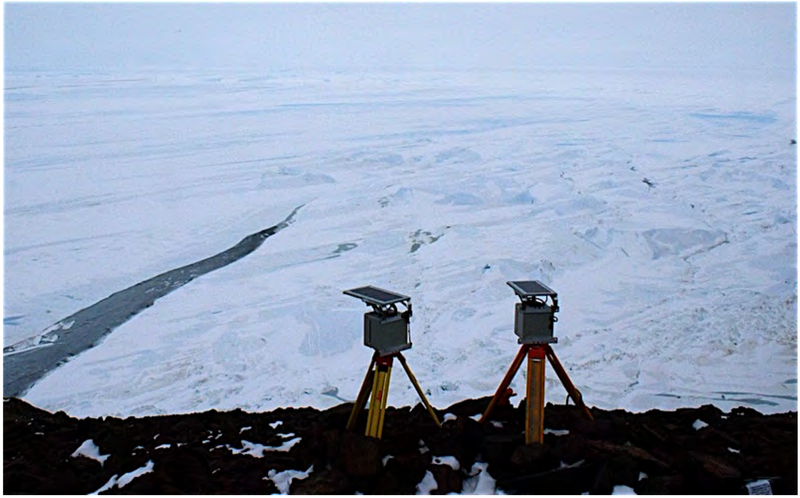 We set up an array of special very-low-frequency microphones (an ‘infra-sound array’) on one outcrop of rock to listen to the deep sounds of cracking and grinding going on in the ice – like the deeper notes of thunder, these can travel many miles. The network of microphones allows us to locate the source of the sounds. The majority will come from the shifting sea ice blocks, but a few will likely come from the large ice shelf bergs. We’ve also paired this through-the-air vibration measurement system with three wide-spectrum seismometers to record the larger vibrations as they travel through the earth. Dr. Erin Pettit adjusts the the infrasound array. Thin orange cables go out to several microphones located 10 to 100 meters away. The orange box on the left is a seismometer. We are even listening to the water. After some careful scouting, our field guide found a path where we could safely approach the water’s edge several hundred feet below our field camp and install a hydrophone. This required a technical climb down a steep crumbling slope (which we’ve dubbed ‘Chucky’s Challenge’ after our intrepid BAS field guide). But this too paid off with several 2-minute data ‘takes’ of the ocean sonic environment. Erin put some of the data on a small speaker one evening after our dinner. It was haunting – booms and bangs and strange squeaks, and a constant background hum of tiny bubbles popping as the ice slowly melts. 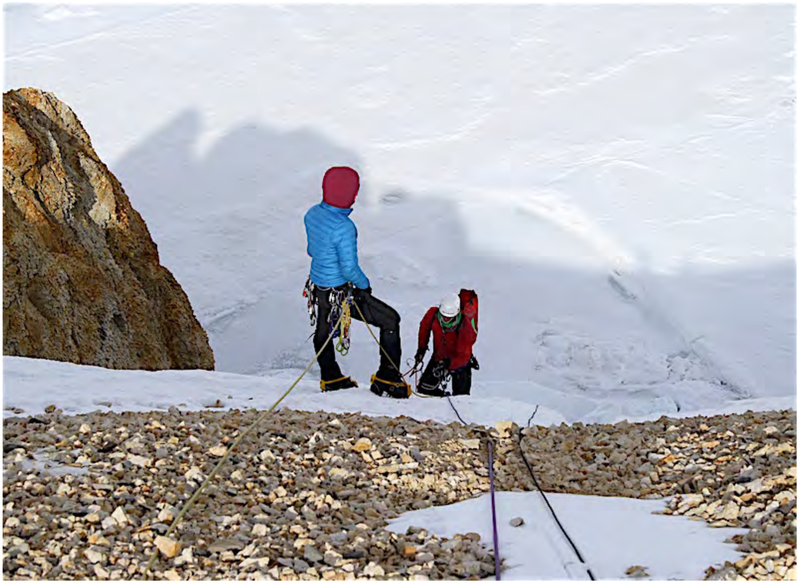 Christina Carr (blue jacket) helps with the ropes as Chucky Stevens lowers himself to the ice-covered water. A small crack near the shoreline allowed us to place a hydrophone into the ocean. We brought one more instrument with us that was intended to be used if a truly spectacular break-up were in progress – a camera system mounted onto a tethered helium-filled balloon (or ‘aerostat’). With a set of tiny cameras looking in all directions, the balloon can provide a continuous panorama of events in the ice for up to 24 hours. We decided to test the system for just a few hours one evening, and learn more about how to manage it for other projects. Set-up for the balloon deployment. Left, Erin indicates the expected direction of the flight. Right,Ted completes the set-up of the camera system just before deployment. Images from Camera 1 on the balloon system. A hand-held GPS is mounted to the payload to record time and elevation during the flight (and records the latitude and longitude internally). 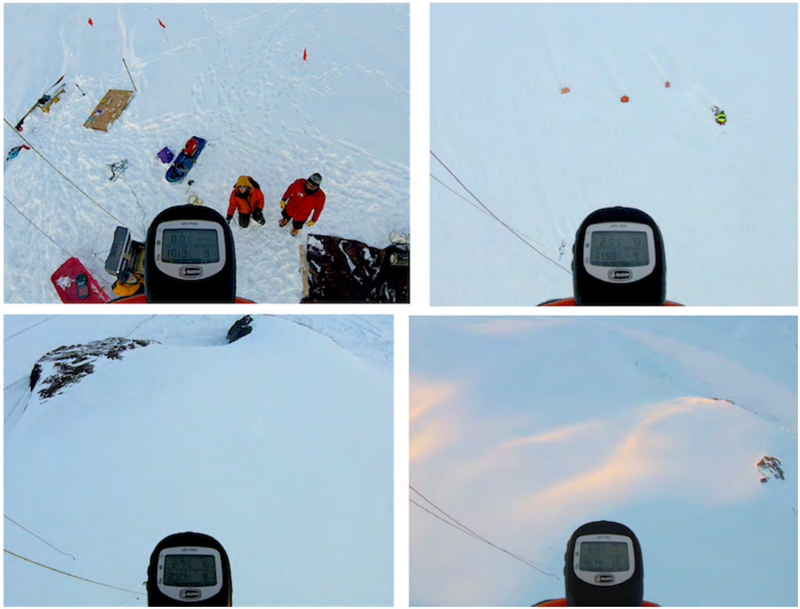 Top left, image from ~25 feet above the surface (1013 feet above sea level), showing Erin and Ted, with Chucky at the balloon winch. Top right, image of our camp from approximately 180 feet above. Lower left, a picture of ‘Pippa’s Point (left outcrop) and ‘AMIGOS Point’ (right outcrop) from an elevation of 1000 feet above camp. Lower right, an image of some of the outcrops north of our camp from an altitude of 4674 feet above sea level. Our work now is mostly managing our instruments, making sure the data acquired are good, and creating back-up copies of what we collect. 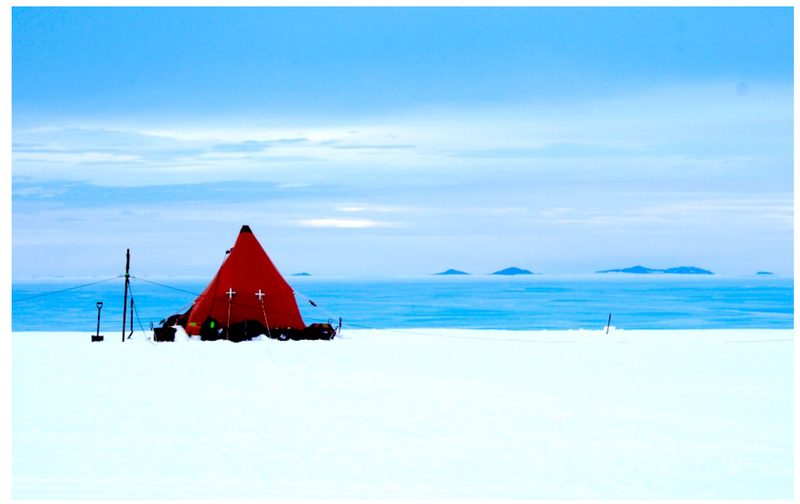 Soon we will begin to pack up the gear and begin our return to Rothera and then South America. We are now the very last science team still out in the field in the British Antarctic Survey network… and it is getting dark every night. It is time to leave, before the Antarctic winter takes hold. Meet the field team for the Scar Inlet survey project: Dr.Erin Pettit is the Principal Investigator,an associate professor from University of Alaska, Fairbanks (UAF); her graduate student, also from UAF, is Christina Carr. 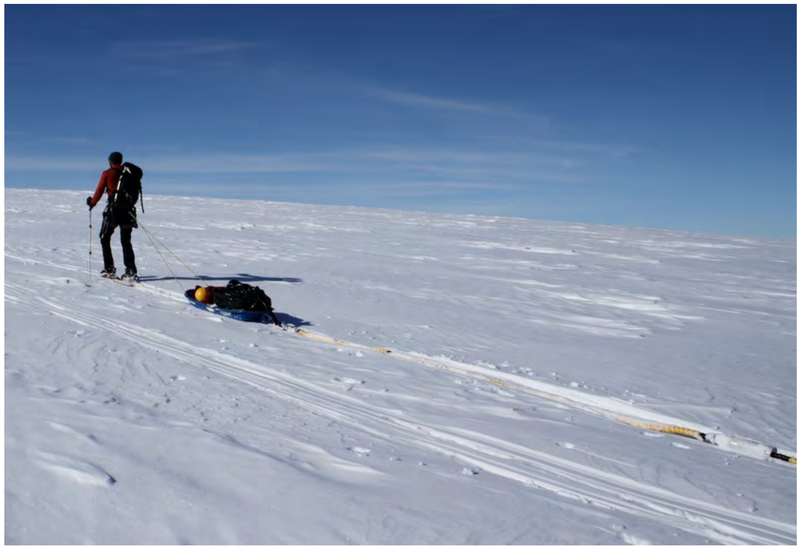 Dr. Ted Scambos is the Lead Scientist at National Snow and Ice Data Center (NSIDC) at the University of Colorado at Boulder, and is the Co-PI for this project. In Antarctica we met our fourth team member, Phil ‘Chucky’ Stevens, a British Antarctic Survey (BAS) mountaineering expert and Field Guide. 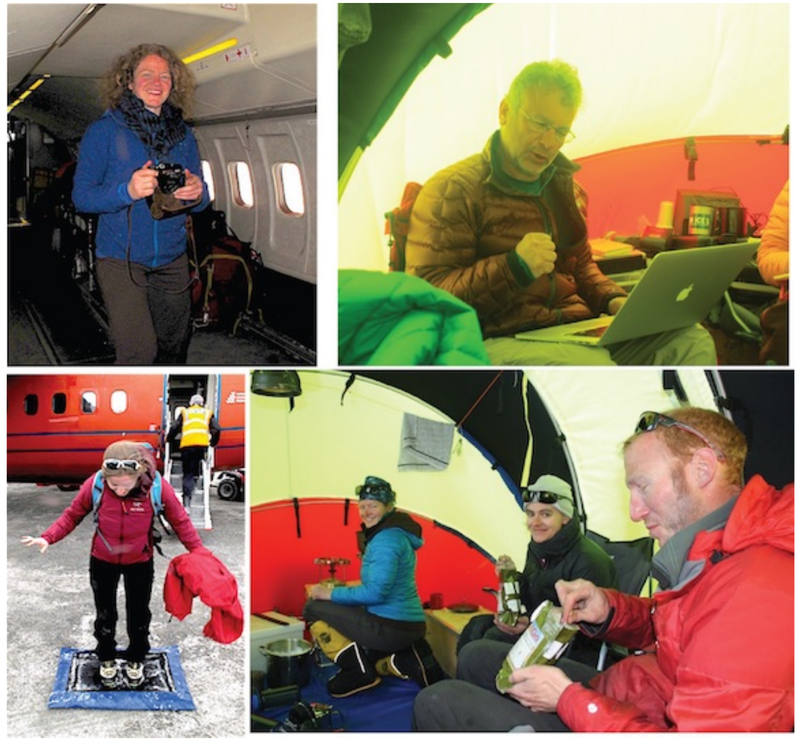 Scar Inlet field team – clockwise from upper left: Dr. Erin Pettit aboard the Dash-7; Dr. Ted Scambos at camp on Cape Disappointment, reading texts on the Denver Bronco’s Super Bowl win; Chucky Stevens digging into a bag of re-hydrated ‘man food’ (now for women, too!) 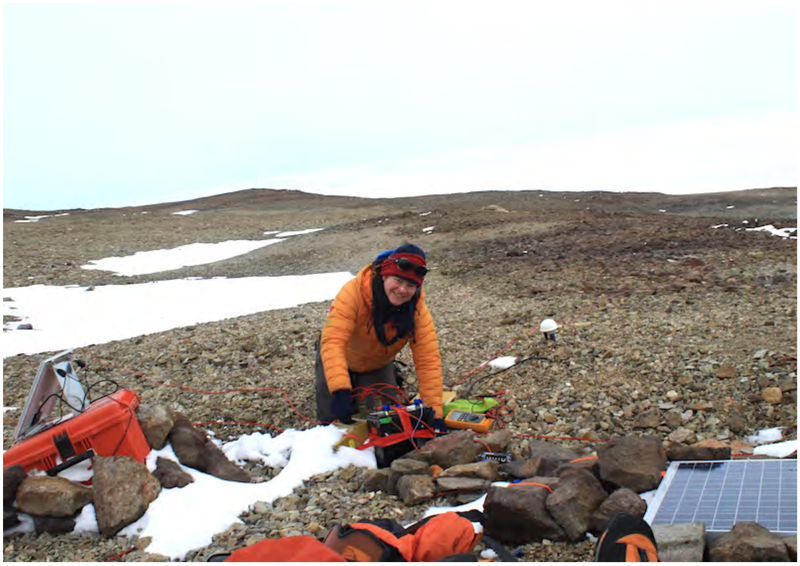 – seen with Dr. Pippa Whitehouse of Durham University (visiting our camp for another project) and Erin; Christina Carr arriving at Rothera Station, and jumping onto the boot wash pad, a pad of sterilizing fluid to limit the number of non-Antarctic species brought to the continent.